What a tremendous success! 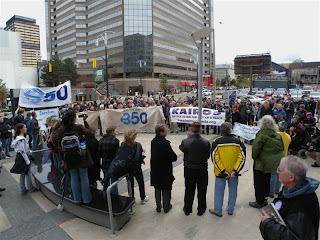 The faith community joined community groups in Hamilton to demonstrate their concerns about global climate change. St James Anglican United Church rang their bells 350 times to summon people to action (in solidarity with 6 other Hamilton churches). I held a GSS workshop at Christ Church in support of the 350 events; our volunteer screened The Power of Community at Centenary United. I will love the land, the air, the water and all living creatures. United with friends. I will save the Earth. United with friends. I promise to keep it. United with friends. I will love the land. United with friends. I'll be a defender. I will save the Earth. 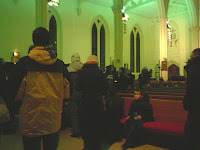 eco churches of west hamilton walk! Members of the newly formed Eco Churches of West Hamilton (eco-WHAM) met yesterday in down town Dundas for a peaceful walk to raise awareness about the need for immediate action on climate change and global warming. The walk started at Christian Life Assembly,proceeded to St James Anglican Church onto St Augustine's RC church and ended at Knox Presbyterian. At each stop, prayers and messages of stewardship from each faith community's teachings were shared with the participant. Refreshments were served and people had a chance to read pamphlets and sign Kyoto Plus petitions and the Target 350 banner. and yet nothing is ever new. and we have been given new things to fear. depending on where we look for honor and how we name our enemies. The easiest thing is to think of returning the blows. 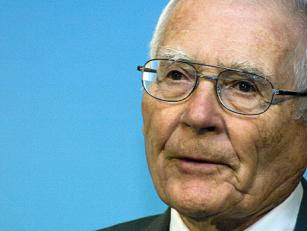 But there are other things we must think about as well, other dangers we face. for ourselves—these may also be our enemies. The changes we dread most may contain our salvation. 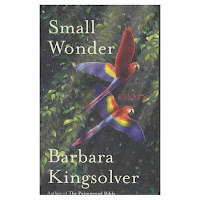 I ended my GSS workshop with these words from Barbara Kingsolver at the Day of Encouragement event at Redeemer University College. It was the Christian Reformed Church's 50th Annual event, pulling in churches from across the nation. Gooooooo Hamilton! Who said our city was apathetic when it comes to climate change action? They're wrong. Read the article below by our Don Mclean of Environment Hamilton. Greening Sacred Spaces is proud of the hand we had in helping to mobilize Hamilton faith groups to action for the 24th October;World Climate Day of Action. All through the planning of this day's events,we've had consistent faith representation-as many as seven leaders at a time. We're proud of you! Large Medium Small Print This Article Tell a friend Church bells ringing across Hamilton Mountain this month are calling to more than the Christian faithful. They are warning us all of the growing climatic dangers that confront the world’s governments trying to construct a post-Kyoto agreement on reducing greenhouse gas emissions. The ringing is scheduled for Saturday, Oct. 24 — the day when Hamiltonians will gather in Gore Park to participate in a global day of action on climate change. It’s one of over 1,700 actions taking place that day in 140 countries, and will include a 3 p. m. walk to the federal building at Bay and York to deliver a message to Canada’s climate treaty negotiators. The bells of a half dozen Mountain Anglican churches will ring out 350 times in total to mark the safe level of carbon dioxide in our atmosphere: 350 parts per million. Unfortunately, the level has already exceeded 385 and is climbing by two or three parts per million every year. That puts us currently about 40 per cent higher than pre-industrial levels. The negative results are already painfully evident in extreme storm events and rapidly melting glaciers and polar ice caps that are disappearing far faster than expected. The two “100-year” storms that flooded over 7,000 Hamilton homes this summer appear to be one small part of a worsening global climatic crisis. Last month, the United Nations reported that greenhouse gas emissions have been going up, not down. In the 1990s they increased by 1.1 per cent a year, but since 2000 the rate of increase has climbed to 3.5 percent annually — higher than even the worst-case scenario contemplated by the Intergovernmental Panel on Climate Change that combines the efforts of climate scientists from every UN country. The Oct. 24 events in Gore Park have a dozen sponsoring organizations, and include musical performances, displays and hands-on activities from noon to 3 p. m. There are also workshops, presentations and film showings starting at 1 p. m. in multiple downtown locations (register between noon and 1 o’clock in Gore Park at King and Hughson). The walk to the federal building starts at 3 p. m. See www.Hamilton350.com for full info. The city has declared October to be climate change action month. Other activities include a high school environmental conference at Mohawk and an Oct. 18 “Eco-Walk” linking together four Dundas churches. Mike Nickerson is one of the featured speakers at the Oct. 24 action. The author of “Life, Money and Illusion: Living on Earth as If We Want to Stay,” is also speaking at a school, two churches and a Dundas town hall meeting that weekend. Don McLean is a director of Environment Hamilton and a volunteer with CATCH (Citizens at City Hall). He teaches environmental studies. 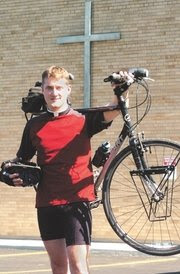 The Community Columnist is a regular feature of the Mountain News. If you would like to write in this space, call editor Gord Bowes at 905-523-5800 ext. 335 to discuss your idea. 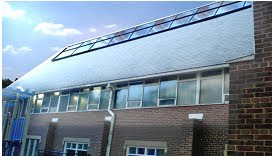 This Saturday (after a delicious breakfast), Melrose United Church along with GSS Hamilton invited faith group leaders to attend a presentation highlighting the results of the building's complete energy audit. Participants learned about the auditing process, the cost and the benefits of having an energy audit for their own faith homes. The audit was conducted by Green Venture with a partial grant from Faith and the Common Good. 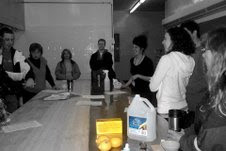 About 25 people attended the event. On Tuesday, August 18th, Environment Hamilton went to visit with the St. Augustine's youth camp in Dundas. Student interns Jordan Bowman and Alessandra Gage led an interactive presentation about saving energy and helping the environment, in addition to running some activities and a seed planting session where children were able to plant local vegetables and herbs at the Church. 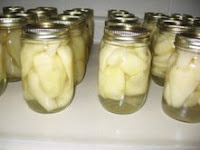 Campers learned about how to save energy in their everyday lives and why it's important to eat locally grown produce. After the presentation and activities, everyone left with Passport to Hamilton maps, Fox 40 whistles, and energy saving night lights. Eating locally produced food is an act of stewardship. 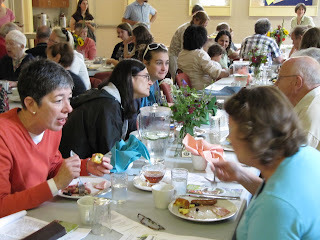 That's the message attendees heard (and ate) at Greening Sacred Spaces Hamilton's 'Celebration of local food' brunch that took place at St James Anglican church last weekend. A project of Environment Hamilton and Faith &the Common Good, the event was a reminder of the call to protect and honour the Earth and the bounty which it produces-a call that resounds across all faiths and religions world wide. The relationship between food and the sacred is recognized in many philosophies. "Currently, our eating practices cause environmental degradation, destroy habit and livelihood and cause untold suffering to animals. Water, air and land are polluted because of the way we do business as usual," said Rebecca Birtch one of the key organizers of the event. Today, in a time where the decisions we make about how we relate to and treat the Earth and the life on it will impact directly and inexorably the future well being of our planet, eating locally produced food is a significant step in the right direction. Over pancakes, sausages, muffins and blueberries participants were made aware of the hunger that resides in the very heart of our community and the measures that are being taken by some local groups to help alleviate a worsening situation. Bill Wilcox of West Highland Baptist Church demonstrated that growing a beautiful vegetable garden on church grounds and giving the produce to the hungry is a good use of space and he challenged others to do the same. Karen Burson spoke eloquently about the need for healthy food for children to grow properly; Environment Hamilton's eat local project is involved with building effective and equitable food systems through institutional purchasing. Tapestry Bistro's Sam Robertson impressed upon listeners Hamilton's amazing amount of resources already in place for procuring locally grown food. "We must get to a level of green house gases that provides safety for our planet," spokesman Don Mclean of Environment Hamilton reiterated, wrapping up the event. Mclean's invitation for participants to join the world-wide 'Day of climate action' on October 24th (an event that is part of the 350.org campaign to get levels of carbon in the atmosphere down to a safe level of 350 parts per millions) was also a call to action to all attendees. For more information about the 350.org campaign and Hamilton's involvement please call Environment Hamilton at 905 549 0900. 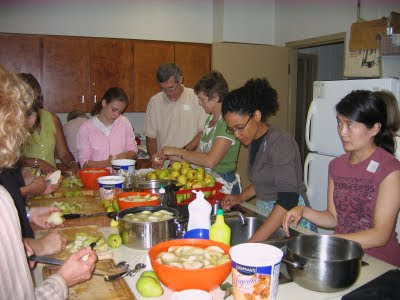 Westdale United Church,May 24th- A small but eager group attended the Food And Water For Our Planet event Sunday evening. We learned how to use faith grounds to feed the hungry and construct our own rain barrels. Westdale United Church has been running a vegetable garden since 1992. The produce goes directly to Wesley Centre Kitchen to feed the hungry. Coordinators, Loueen Madill and her son Stephen gave a presentation followed by a tour of the garden (tomatoes and green peppers). Writer and environmentalist, Sean Burak demonstrated how to construct our own rain barrels. Sean is passionate about water conservation and is generous about donating his time to give workshops on rain barrel making. He donated this one to the Westdale Untied Church community. 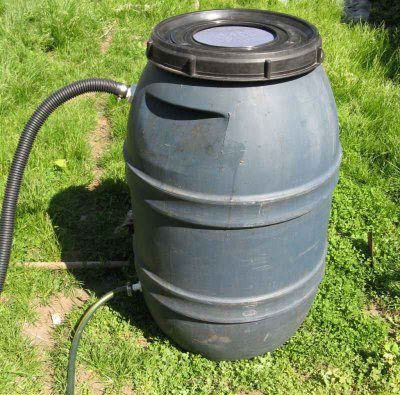 He also sells excellent ready made rain barrels. Marina Fensham of Central Presbyterian Church and owner of thinkGiraffe Environmental Designinvited me to speak about the Greening Sacred Spaces program to an audience of 20 church secretaries. It was a very good idea since many secretaries are the ones who know theins and outs of running the church-they buy the cleaning products, the know who does what etc. The presentation was warmly received and the participants said they learned a lot. So did I!